Mexico Replaces Police With Soldiers In Border Area In the border state of Tamaulipas, the Mexican army is taking over full control of police departments in some of the most troubled cities. Drug cartels have been operating with impunity, and authorities say it could only happen with police involvement. Mexican soldiers have taken control of the police department in downtown Matamoros, in the border state of Tamaulipas. In Mexico, one controversial part of President Felipe Calderon's war against the drug cartels has been the use of the military to fight organized crime. Now in the border state of Tamaulipas, the Mexican army is taking over full control of the police departments in some of the state's most troubled cities. In May, municipal police across Tamaulipas were ordered to turn in their weapons. This week 3,000 armed reinforcements from the military finally arrived to help patrol the state. The Mexican government sent soldiers to replace police in 22 municipalities, including the border cities of Nuevo Laredo, Reynosa and Matamoros. Outside the main police station in Matamoros — across the border from Brownsville, Texas — scores of police officers lounge around in the parking lot. Others sit idly in the lobby. They're in uniform but their weapons are conspicuously absent from their holsters. All of the city's police, except for the traffic cops, have been ordered to stay in their barracks. Police Chief Gabriel Lopez Ordaz says the directive came from Mexico City. "They think that many police could be involved in criminal activities," he says. Ever since the Zetas drug cartel broke from the Gulf cartel two years ago and the gangs began battling for control of Tamaulipas, the state has appeared to be beyond the control of authorities. Criminals have been operating with impunity, and authorities say this could only happen with police involvement. Lopez is a career military officer who spent 36 years in the Mexican army. He became police chief in Matamoros just five months ago. Lopez says all of his police officers will have to go through a rigorous confidence test that includes psychological and drug screening. "So we know that we have trustworthy police," Lopez says. Those who pass the confidence test will then be sent to a retraining program. Lopez says it could be almost a year before the officers are allowed to return to the streets. For now, only the bodyguards for the police chief and the mayor have been allowed to still carry their weapons. The state of Tamaulipas has been convulsed by violence recently. In June of last year, the leading candidate for governor was gunned down just days before the gubernatorial election. In September, 72 migrants were found executed on a ranch. Two months ago, authorities uncovered a series of mass graves in San Fernando that held more than 180 bodies. Gun battles in Matamoros between authorities and the Zetas or Gulf cartel sometimes rage in the streets for hours. Lopez is a military man, and he accepts the order to pull his police officers off the street, but he says it's going to be hard for just 200 soldiers to replace almost 600 local cops. "First of all, because these are people who aren't from here," the police chief says. "The soldiers don't know the terrain, they don't know the population. They don't really know the situation. So it's going to take some time for them to get positive results." 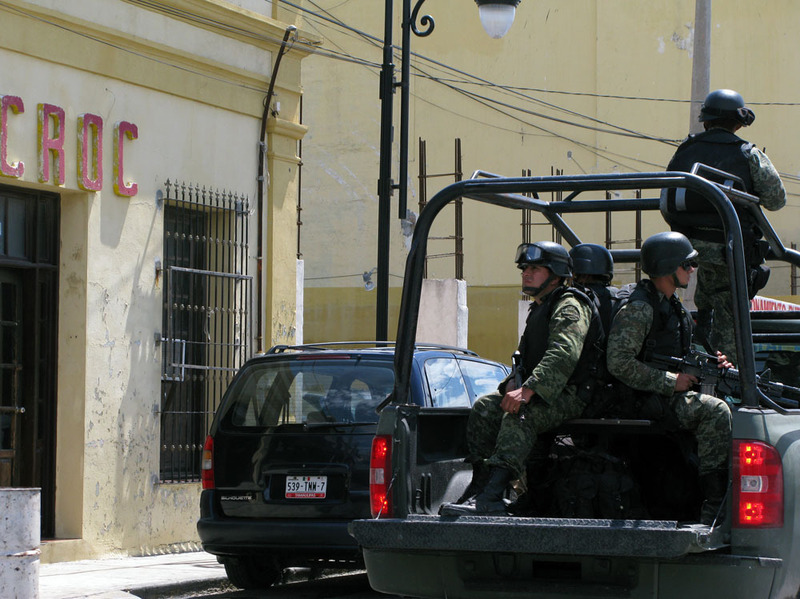 The Chamber of Commerce in Matamoros issued a statement saying they're concerned about the "militarization" of the police force and called on the soldiers to respect the human rights of the local citizens. Enrique Mena Saenz, the secretary of the chamber, says he worries that the soldiers will only focus on the drug cartels and other organized crime while ignoring petty crime. Mena says a week and a half ago someone broke into his yard and stole the water pipes on the side of his house to sell the copper for scrap. "And they left me with all the damage," he says. The soldiers who now patrol Matamoros are unlikely to recover his lost plumbing. Pickup trucks loaded with heavily armed troops race through the streets in convoys. The soldiers were given maps to help get themselves acquainted with the city. Federal officials, however, say this is an important strategy to regain control of Tamaulipas. They say the presence of the military will give cities time to purge their notoriously corrupt police departments and then build new ones.